The total amount of dog bite claims has increased precipitously in recent years, and now stands at over $32,000 per claim. The phrase “dog bite” is actually somewhat inaccurate, since many times, the knockdown alone is sufficient to cause serious injuries. Moreover, in most cases, the collateral consequences of these incidents are very serious. Younger victims often suffer from Post Traumatic Stress Disorder-type symptoms. The nightmares, flashbacks, heightened awareness, and so on often make it difficult for them to function in their everyday activities. On the other end of the age scale, older victims often never entirely physically heal from their injuries and are unable to live independently in the wake of a dog bite. In most cases, the dog owners are responsible for all these collateral injuries and costs. Strict Liability: If the injury occurs when the animal was under the owner’s control — whether in a public or private place — the owner is liable for damages as a matter of law, even if the owner did not know about the risk of attack. Negligence: Nonowners may be liable for damages as well, if their conduct falls below the acceptable standard of care; for example, a school is negligent if its teachers allow a stray dog to wander onto school grounds and play with children. Negligence Per Se: The negligence “as such” rule applies in cases that involve a violation of a leash law or other safety statute. In Florida, a violation of a non-penal statute is evidence of negligence, but not conclusive proof of negligence. Scienter (“Knowledge”): Temporary caregivers, such as dog walkers, may be liable for damages if they knew that the dog was vicious. Landlords: If one tenant has a dangerous animal, the landlord has a duty to protect the other co-tenants in the building. Similarly, if the landowner has a policy that prohibits certain dog breeds, the landowner does not enforce the policy, and a forbidden animal attacks someone, the landowner may be responsible for damages. In addition to compensatory damages, defendants may also be liable for additional punitive damages, in some extreme cases. 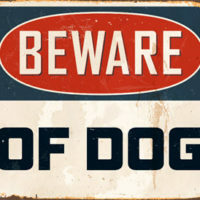 If the victim could see, read, and understand the sign, a “Beware of Dog” sign immunizes the owner from liability, if the attack occurred on the owner’s premises. If such a defense is unavailable, insurance company lawyers usually try to shift blame to the victim with the provocation defense. If the victim inflicted extreme physical harm on the animal that justified a violent response, this defense usually applies. Verbal teasing does not constitute provocation, and as a matter of law, children under six cannot provoke an animal. Florida is a pure comparative fault state, so if the jury finds that the victim and tortfeasor (negligent actor) were both partially at fault, the judge divides damages strictly on the basis of fault. For example, if the victim’s damages were $100,000 and the jury divides fault 50-50, the tortfeasor is liable for $50,000. Dog owners are nearly always liable for the serious direct and indirect injuries that their animals cause. For a free consultation with an experienced personal injury lawyer in Brandon, contact Reed & Reed. We have four area offices (St. Petersburg, Lakeland, Tampa, and Clearwater).